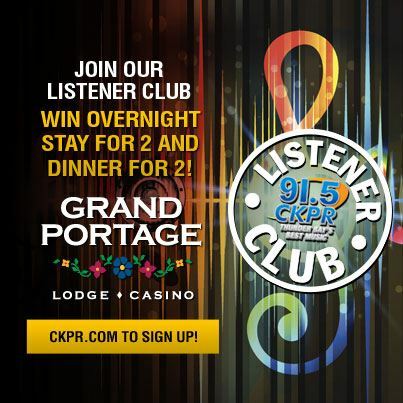 91.5 CKPR has paired up with recently renovated Grand Portage Lodge and Casino for our Listener Club for the month of April! Join the 91.5 CKPR Listener Club for chance to WIN great prizes, community insight and event announcements! And, as an added bonus, Danny and Laura will pick a lucky winner from the Listener Club EVERY FRIDAY. For the month of April, listeners will have a chance to win an overnight stay at Grand Portage Lodge and Casino AND dinner for two! CLICK HERE to join the Listener Club and you will be automatically entered to win great prizes.